CLOUSTON Associates have a long history in the planning and design of waterway projects. We’ve undertaken the planning and design of more than 40 major waterway projects across Australia. The “Parameters for the River” was one of our earliest projects. It included a suite of guidelines for the restoration of and access to the Parramatta River and its foreshores. Authored by our founding Director Leonard Lynch for the National Trust in 1976, it’s still delivering change to the Parramatta River today. Other landmark projects including our Todd and Charles River design in NT and the Clarence River Way masterplan in NSW. The Queanbeyan project is the latest scheme to win praise. It was recognised at the AILA NSW Awards 2017 and was named NSW/ACT “Park of the Year” at the recent 2017 Parks and Leisure Australia Awards. Like many riverfront cities, Queanbeyan CBD has over many years turned its back on its greatest asset – the Queanbeyan River. The Queen Elizabeth II Park and Collette Street upgrade redresses this problem. It re-connects the city with its river and establishes the river foreshore as a valuable public asset. CLOUSTON refined the original masterplan developed for the site by Oxigen. In the process, we have transformed an underutilised riverfront into a dynamic parkland. The park helps support a healthy, inclusive and robust community by providing a river-based recreational venue. 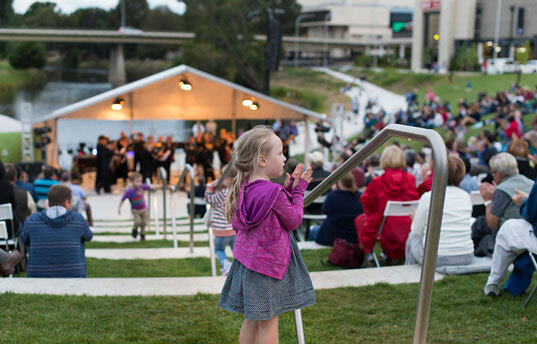 The recent Symphony by the River was a huge success with a 500 strong crowd turning out to see the Canberra Symphony Orchestra. The market terrace hard stand areas provide hard-wearing spaces for market stalls. Lawns, picnic shelters, BBQs and the playground facilitate gathering and social interaction. The interactive water-play park, convenient toilet facilities and playground are a key attraction for families with young children. The new park works well with the city’s dynamic river system. Its robust design is capable of being submerged by several metres. Its soft riverfront edge also provides a platypus habitat. By celebrating rather than ignoring this vital asset, the scene is set for an extended riverfront parkland network. 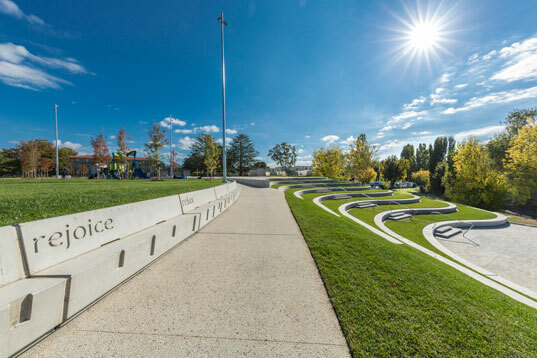 At the recent 2017 Australian Institute of Landscape Architects (AILA) State Awards competition, the project won a Landscape Award for Parks and Open Space. The AILA judging panel commended the strong visual image of repetitive, sculptural forms beside the river that focus on an amphitheatre capable of handling large-scale events. The interactive fountain and play areas have been embraced by the community as a new recreational destination. The practice continues to develop its work in this field and in the integration of waterfront and parkland at the Parramatta North Urban Transformation site. For more information on CLOUSTON’s waterways capabilities, call managing Director Crosbie Lorimer on 02 8272 4999.